Carpal tunnel syndrome grip strength test. 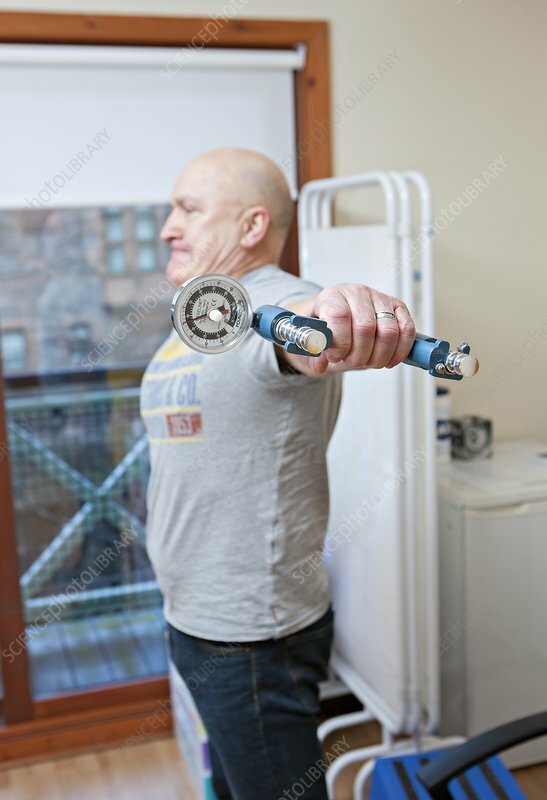 Patient performing a grip strength test as part of an assessment being carried out at a general practice (GP) clinic to determine the severity of a case of carpal tunnel syndrome (CTS). The strength of his grip is being measured using a hydraulic hand dynamometer. Carpal tunnel syndrome is caused by the median nerve from the arm being trapped by bones and ligaments in the wrist. It can cause pain and numbness in the fingers, and can affect hand and wrist function. In severe cases, the ligament trapping the nerve may be surgically cut to treat the condition. Photographed in Edinburgh, Scotland.